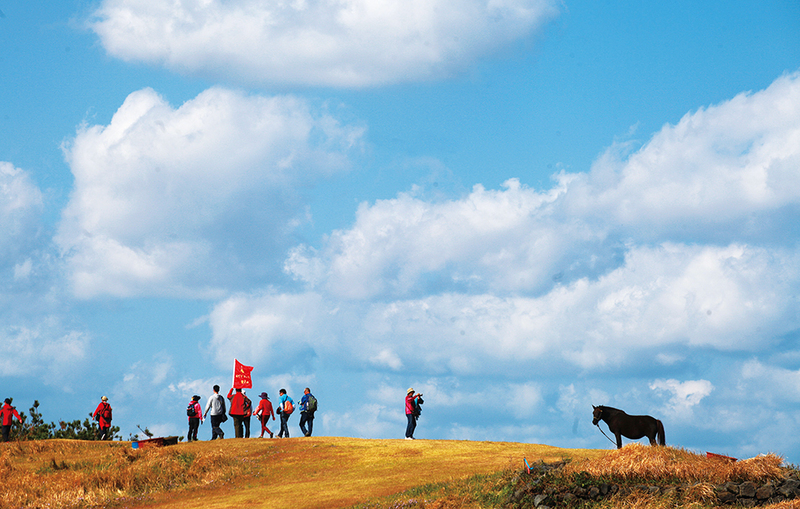 Inspired by Spain’s legendary Camino de Santiago, journalist Suh Myung-suk founded Jejudo’s Olle Trail in 2007 as a healing space where world-weary people could recharge and reconnect with nature. Now totaling 21 routes that circle the entire island, the trail has proven a phenomenal success, drawing over a million hikers every year. 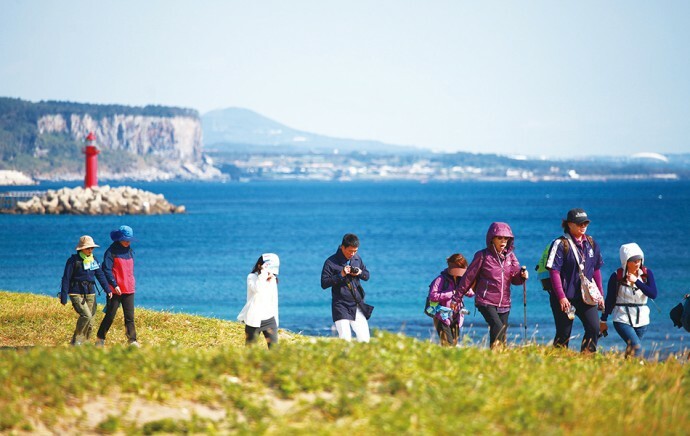 The Jeju Olle Walking Festival celebrates this special part of Jejudo Island’s cultural landscape by highlighting three of the routes. This year’s festival takes place along routes 17, 18 and 19 along the northern side of the island. 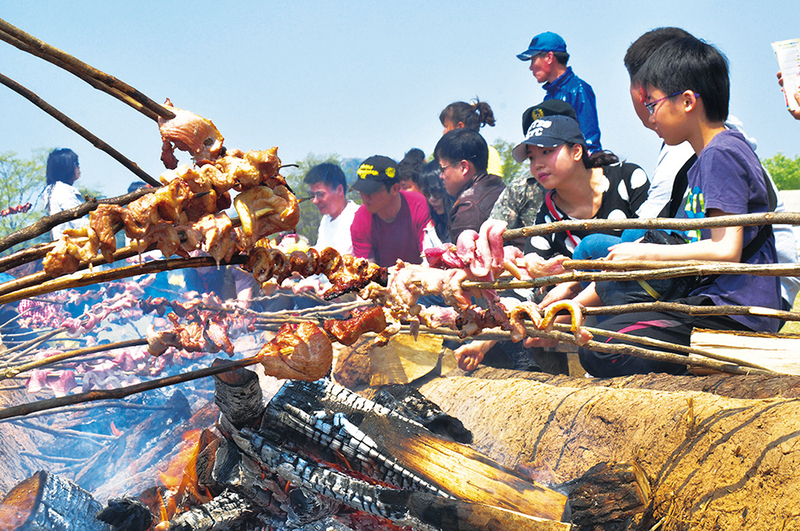 Villages along the festival route will welcome participants with a wide range of cultural performances and local dishes found only on Jejudo. EAT> Jejudo is known for its very unique cuisine, which is a reflection of its island culture. 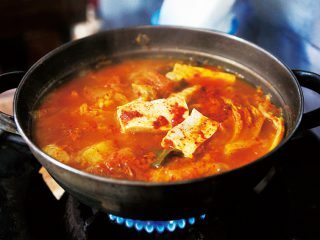 Specialties include jeonbokjuk (abalone porridge), black pork and a wide range of seafood. Stalls will be set up along the walking trails, so don’t worry about going hungry. STAY> Because Jejudo is one of Korea’s top tourist destinations, the island is covered with hotels, guest houses and other forms of accommodation. You’ll no doubt find places to stay along the trails, but if you’re looking to go upscale, try the Ramada Plaza Jeju Hotel (T. 064-729-8224) in Jeju City. DO> As you walk the path, be mindful of where you are. This isn’t just a hike—it’s a healing experience. SEE> Along route 19 you’ll find the Neobeunsungi 4.3 Memorial Hall, a memorial to one of Korea’s most tragic events. GO> Discount airlines Jeju Air and Jin Air both fly to Jejudo Island several times a day. In 1977, a US Army staff sergeant enjoying some leisure time happened upon some rocks where he found an ancient hand axe, a revolutionary find as it was the first proof that Paleolithic culture did in fact exist in East Asia. The Jeongok-ri Prehistoric Site, as the spot is called today, yielded over 3,000 artifacts in the excavations that followed. Some of those remains are on display at the beautifully designed Jeongok Prehistory Museum. 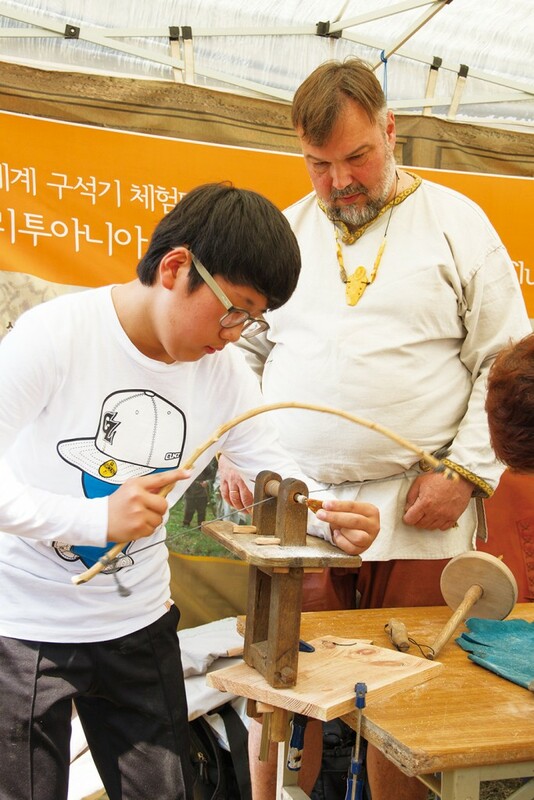 During the Yeoncheon Jeongok-ri Paleolithic Festival, you can take part in family-oriented programs like hands-on archeology classes and watch performances by actors doing their best to emulate the dress, customs and mannerism of Paleolithic humans. EAT> Woolly mammoth burgers—just kidding. Plenty of food stalls will be set up during the festival, and local farmers will be on site to sell local produce. There will also be a prehistoric barbecue where you can cook up some pork caveman-style. STAY> This is a day trip from Seoul. DO> Let the kiddies go nuts with all the hands-on programs for children. SEE> While much of the festival is pretty hokey, the Jeongok Prehistory Museum, designed by French architectural house X-TU, certainly is not: a must-see for any self-respecting architecture fan. 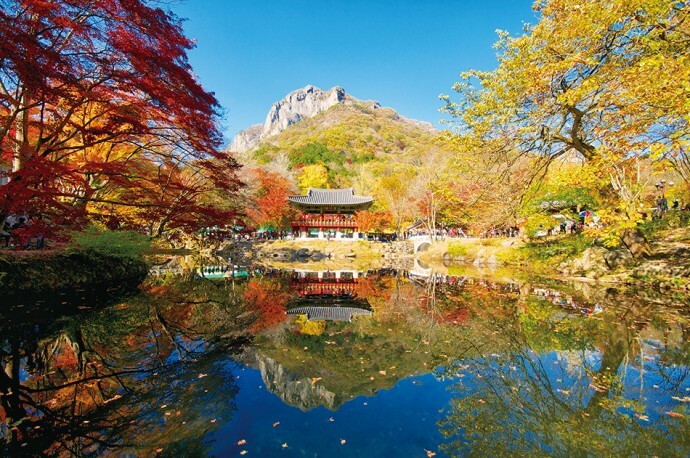 GO> Take the Gyeongwon Line to Hantanggang Subway Station, and then take a local bus to Jeongok Prehistory Museum. An enormous massif that covers large swaths of the provinces of Gyeongsangnam-do, Jeollabuk-do and Jeollanam-do, Mt. Jirisan is home to some of Korea’s tallest peaks, including Cheonwangbong (1,915 m), the highest point on mainland Korea. It’s a monumental place of towering mountains, deep valleys and pristine rivers—to properly explore it would take months, if not years. Its slopes are home to several beautiful and historic Buddhist monasteries, which are treasure troves of Korean art. EAT> There are some good eateries in front of Hwaeomsa Temple in Gurye, including some fantastic jeongsik at Sanchae Sikdang (T. 061-782-3223). STAY> If you’re hiking Mt. Jirisan’s main ridge, you should stay in a shelter—there are eight of them on the ridge. The Nogodan, Byeoksoryong, Seseok and Jangteomok shelters, which are located roughly equidistant from one another along the ridge, are all quite large, with shops selling snacks (like instant noodles) and basic supplies. The others are equally simple. DO> Take in the autumn colors in the Piagol Valley, or “Valley of Blood,” whose name refers to the blood-red color of its maples in autumn. SEE> The Buddhist monastery of Hwaeomsa is essentially a rustic museum of Korean Buddhist art and architecture. 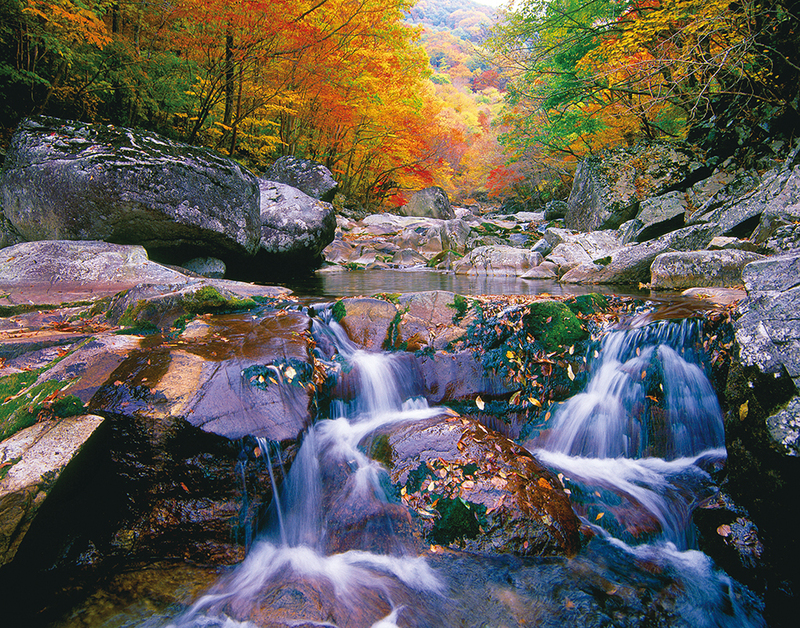 The area around Baegyangsa Temple, which is part of Naejangsan National Park, is famous for its spectacular autumn foliage, some of the most beautiful in Korea. Every year, the temple’s maples turn the brightest crimson, a color made all the more dramatic by the deep blue skies above. The Jangseong Baegyang Maple Festival celebrates this natural beauty with cultural performances, craft programs and food, but the real highlight here is the trees themselves. EAT> You’ll find plenty of great Jeolla-do Province food in the restaurants in front of the temple. STAY> There are several small inns throughout the nearby town of Jangseong. DO> If you’re up for it, hike up to the hermitage of Yaksaam for great views of the valley. SEE> The reflection of Mt. Baegamsan’s Hakbawi (“Crane Rock”), Ssanggyeru Pavilion and the autumn foliage in the pond in front of the temple. GO> Trains to Baegyangsa Station depart from Yongsan Station (travel time: 3 hours, 30 minutes). You could also take a KTX to Jangseong Station (travel time: 2 hours, 30 minutes). During peak foliage season, you may have to walk an hour from Baegyangsa Station due to heavy traffic. 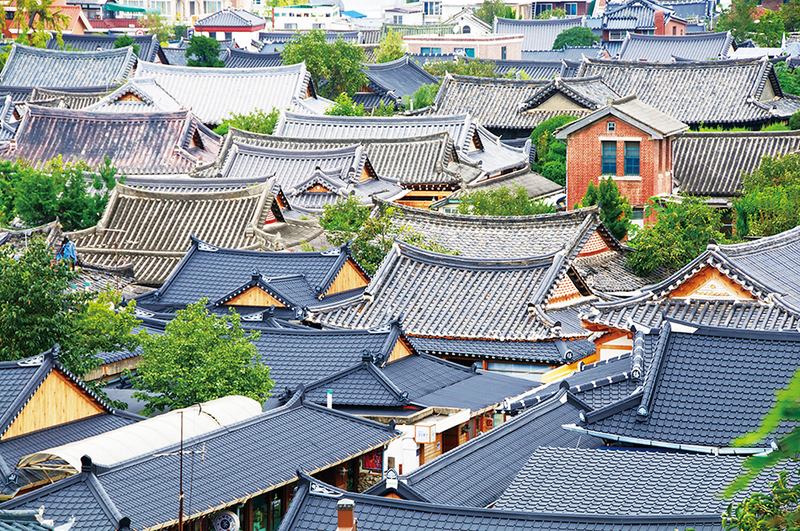 In order to properly appreciate Jeonju Hanok Village, be prepared to get lost. And leave your watch at home. A maze of picturesque alleyways lined by handsome old Korean homes, Jeonju Hanok Village is a piece of an older, simpler and infinitely slower Korea. Every corner, every back street yields a new discovery. Hidden away amidst the tile roofs and greenery are charming guest houses, quiet teahouses, historic Confucian shrines, artisan workshops and stately old trees that have stood their ground for centuries. If there’s something in particular you’d like to see, by all means, bring a map. Otherwise, experience the town as it was meant to be seen—very, very slowly. EAT> Tons of great places to eat in Jeonju, including many places in Jeonju Hanok Village itself. It’s best known dish is the Jeonju bibimbap—rice mixed with fresh vegetables and a tangy pepper sauce and served with a spread of side dishes. Jeonju’s best known bibimbap house is Gogung(T. 063-251-3211), a taxi ride from Jeonju Hanok Village. Closer to the hanok village is Gajok Hoegwan (T. 063-284-0982), which is also highly recommended. 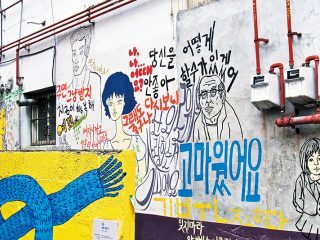 This writer recommends Seongmidang (T. 063-273-0029), a smaller place hidden in an alley near Gajok Hoegwan. It’s friendly, held in high esteem by locals and, above all, does great food. A Jeonju bibimbap will run you KRW 10,000, or KRW 12,000 for one topped with raw beef (yukhoe bibimbap). STAY> Jeonju Hanok Village is about hanok, and there’s no better way to experience the charm of a Korean traditional abode than spending a night in one. There are many good hanok guesthouses in the village. One of the better ones is the Hakindang (T. 063-284-9929), a palatial estate built in 1905 by high-ranking royal official Baek Nak-jung. When we say palatial, we mean palatial—the home’s architecture incorporates aspects of royal palace design. SEE> Overlooking Jeonju Hanok Village to the east is a small hill topped by a grand Korean pavilion. The hill provides good views of the entire hanok village. DO> Experience the paper making process at Jeonju Traditional Korean Paper Center (T. 063-232-6591). GO> KTX express train service connects Jeonju with Seoul’s Yongsan Station (travel time: about 2 hours, 10 min). You can also take express buses to Jeonju from Seoul’s Central City Bus Terminal (travel time: 2 hours, 45 min).